This high quality premium cotton ring spun t-shirt shows the image of the Triumph Thruxton Ace 1200R painted by Makoto Endo. 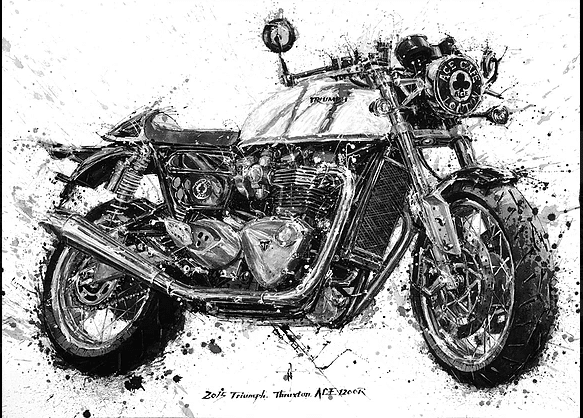 The digital direct to garment printing recreates the exact image of this amazing painting, where the artist has successfully managed to reach his goal by “painting the sound of the engine”. Makoto paints in his socks, with a blanket to cushion his knees, black and white ink as his medium, and a few pairs of chopsticks as his tools. But he’s doing more than splashing paint onto six by four-foot canvases. He creates an outline, adds a flurry of sprinkles and splatters, then painstakingly drips and spreads the ink with deft swipes.